Spencer Plaza, one of the biggest shopping malls in South Asia, is located on Mount Road (officially known as Anna Salai), and is one of the landmarks of the modern Chennai, Tamil Nadu state, India. The historical roots of Spencer Plaza goes back to British Raj, when in the year 1863-1864, the first Departmental store in the Indian subcontinent (comprising India, Pakistan, Bangladesh and Sri Lanka), established by Charles Durant and J. W. Spencer. After a few years, Eugene Oakshott shifted the department store to a new building, which was an example of Indian Indo-Saracenic style of architecture. The building was designed by W. N. Pogson. In the year 1985, the original building was destroyed in a fire. The present Spencer Plaza was constructed on the same site. 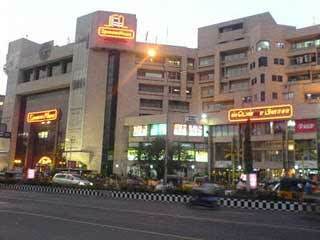 This shopping mall is the major hangout for people of Chennai. The mall has been developed by Mangal Thirth Estate Limited. It now comprises 3 phases, Phase I, Phase II and Phase III. Phase III is the most recently opened. The Plaza has a number of stores dealing in goods of many major brands, as well as local brands. It also has retail shops of many of the leading brands in Jewelery, Merchandise, Clothes etc. In this complex, leading names like Food World, Music World, Health & Glow, Vummidiars, Van Heusen, Proline, Arrow, American Express, Allen Solly besides a lot of retailers dealing with jewellery, domestic appliances, leather goods and handicrafts are housed. Other comforts like central air-conditioning, smooth-moving escalators to the first and second floors, glass capsule lifts to all the seven floors, well-lit atriums, info-desks are available. The shopping area spreads across ground, first and second floors. Office units are spread between fourth and seventh floors. An exclusive car park is located partially in the second floor, and fully in the third floor.